As the mosquito-borne chikungunya virus continues to spread, the Orange County Health Services Department’s Mosquito Control Division is urging people to protect themselves from possible infection while taking proactive measures to reduce the threat of an outbreak. Chikungunya (“chik-en-GUN-ya”) produces flu-like symptoms characterized by high fever and joint pain. Other symptoms may include headache, muscle pain, joint swelling or rash, according to the Centers for Disease Control and Prevention. The virus, which is seldom fatal and cannot be spread by humans or animals, usually resolves on its own. 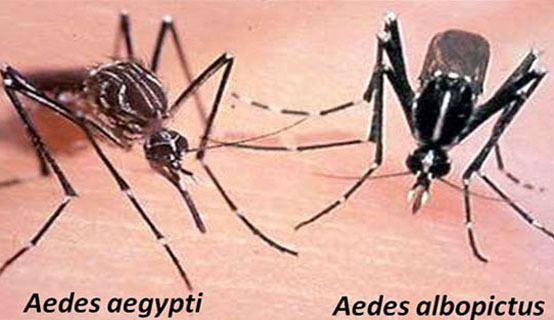 The mosquitoes capable of transmitting chikungunya locally – the Aedes albopictus (Asian Tiger mosquito) and Aedes aegypti (Yellow Fever mosquito) – are small, black-and-silver insects. They bite primarily during the day and sleep at night and are not a threat to animals. Unlike most other mosquitoes, they are found near residences in containers – not in large bodies of water, such as lakes. Children and seniors are not more susceptible to the virus, but they are likely to suffer more serious symptoms. There is no vaccine or medication available to prevent infection, and the virus can only be treated symptomatically. These mosquitoes are “day-biters.” Unlike other mosquitoes we typically see here in Central Florida, the small, black-and-silver insects are active from dawn to dusk and typically rest at night. They can go from egg to adult in seven days. Drawn to standing water. Also, unlike other mosquitoes, they are not drawn to large bodies of water such as lakes or retention ponds. They breed in containers. Clean out items that collect water. Areas close to homes, schools and playgrounds should be kept clear of standing water: gutters, flat roofs, tire swings, children’s toys, bird baths, plant saucers, trash cans, and even something as small as a bottle cap. Wear insect repellent. When you’re outdoors, use products that contains DEET, which is the gold standard in insect repellents. Orange County Health Services Department’s Mosquito Control Division, which actively sprays to control the mosquito population, is a resource available to all citizens, including those who would like their property checked for these mosquitoes. Call (407) 254-9120 for Mosquito Control, or dial 311 to learn more about related services provided by Orange County. The first case of chikungunya in the Western Hemisphere was documented in late 2013; since then, there have been 431,000 cases in the Caribbean. Now, health officials believe that infected mosquitoes have appeared in Florida for the first time, as the state’s 77 cases (as of July 22) include two people who contracted the virus locally; the other cases occurred during travel outside the continental U.S. The individuals in the two locally transmitted Florida cases were bitten by an infective mosquito that acquired the virus in Florida (probably from someone coming from the Caribbean). From 2006-13, an average of 28 people per year were diagnosed with chikungunya in the U.S. and its territories. This year, the number is 497.